The year 2008 will go down in history as the final year of the presidential primaries, which started approximately three years before any of the candidates were born. That was highly entertaining for everyone except the American people that had to suffer through approximately 10,000 hours of political commercials per day. January – Lost debuts, giving people hope that all the weird questions about the show will be answered. Hollywood was in the midst of a writer’s strike, which meant that a lot of people who you’ve never heard of were running around with picket signs. Hollywood executives were very concerned, and said so through numerous very sincere press releases from their limousines. People were just beginning to realize that what was going on meant disaster because it meant more reality television. By the end of the month, all the experts were saying that the writer’s strike was going to last for at least another six months. February – Listening to the experts in January, the American people brace themselves for a long strike, which ends in early February. The show “The Return of Jezebel James” proves that some shows weren’t meant to show up, let alone return from anywhere. April – Miley Cyrus poses for photos for Annie Leibovitz in Vanity Fair, and everyone is actually shocked when they turn out to be a bit provocative. They use the excuse that all the adults went to the bathroom at the same time while this was happening, and they promise never to do that again. May –Survivor Micronesia’s biggest Survivor fan ever, Erik, must have missed all the shows where people scheme behind each other’s backs and gives up an immunity idol on the show. 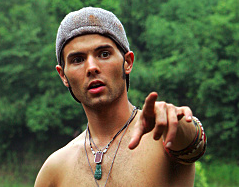 He’s completely shocked when they actually vote him off the tribe for being stupid. Indiana Jones returns in “Indiana Jones – Raiders of the Lost Teeth”. Lost’s season ends, leaving us with a lot of old weird questions unanswered, and a whole bunch of new weird questions unanswered. June – Jamie Lynn Spears gives birth, trying to top her sister in the “I’m Crazier Than You” category by naming the kid “Spearmint”, before later changing it to “Maddie Briann”. George Carlin dies, causing everyone else to say seven dirty words. Pixar knocks another animated movie out of the ball park when it debuts “WALL-E”, a movie where a robot discovers a group of humans that just sit around in front of screens and do nothing but eat. This movie goes over very well with a bunch of humans who sit around in movie theatres, watch a large screen and do nothing but eat. July – Brad Pitt and Angelina Jolie give birth to twins – This was mostly Jolie’s role, although Pitt said he could have done the birth himself, if the role had called for it. They’re both surprised when they realized they could have their own kids, rather than traveling around the world looking for them. August – Summer Olympics starts up in China with a spectacular show that can be seen in high-definition, even from the moon. They use humans to form a large pyramid, letters of the Chinese alphabet, and the stadium itself. Controversy unfolds as Europe accuses a 6 month old Chinese child wins the gymnastics all-around, and also accuses Michael Phelps of being part dolphin. The press announces that Madonna turns 50, still performing in her “I might break a hip” tour. September – New Kids On The Block release a record – again; 90210 debuts – again; People begin to wonder if any new things are going to ever come out, or if we’re doomed to recycled television shows. SNL returns for it’s 600-th season, and breaks it’s own record for actually being funny twice in one season. Heroes starts a new season, which promises to be all different this time around because this time they’re going to save the whole world! “High School Musical 3: Senior Year” debuts, millions of parents pray that none of them end up in college for a four movie sequel. November – The election finally ends; half the country is upset, half the country is overjoyed, and half the country doesn’t understand there aren’t three halves in a whole. “Twilight” opens, which is yet another story about vampires falling in love, which was never done on a show like “Angel” or “Moonlight”. On Heroes, the “Villains” episode is shown. This proves to be a turning point in the show because things are a lot more interesting when the Heroes have someone to go up against; unfortunately, there aren’t many new characters, just a lot of old ones behaving badly. “24: Redemption” is shown, but it turns out that it has nothing to do with S&H Green Stamps. December – NBC announces that Jay Leno will now be on at 10 pm, allowing everyone to go to bed an hour earlier. Dante and his two sons were having problems. Dean is the owner/cook/janitor. Sammy and Arthur (his sons) are servers. Mark is the host/manager, who Sammy considers an interior decorator. They’re in about $200,000 in debt at the time of taping. Gordon Ramsay was set to arrive in Los Angeles to help the Sante La Brea, and the chef didn’t show up, which put everyone on edge. When Gordon finally arrived, he didn’t seem to impressed with the appearance of the outside facade of the restaurant. He was even less impressed with the inside, when Dean started to give him the tour of the “newly remodeled” restaurant. There was grass/vegetation growing in aluminum trays up on a shelf. Dean grabbed one, and to Gordon’s surprise, he ate a bunch of whatever was growing in that tray! Gordon asked about the menu, and Dean said they have vegetarian and regular versions of the dishes… and the chef didn’t show up. Gordon wanted to get to the root cause of the problems with the restaurant and Dean said it’s money. Mark spent $5,000 on a display of “product”, and Dean said Mark is just a big talker. Mark described what he does as trying to make the restaurant look more hip, fresh and modern. He said that he wanted to make the place “look like no place you’ve ever seen”. Gordon told him that he “definitely, definitely not wrong there”. Mark took that as a compliment. Gordon went out to the terrace outside the restaurant and orders food. First comes a Turkey Patty melt, which he said doesn’t look healthy, and ended up feeding it to a dog that a nearby customer brought in. The next thing that cam was a stir fry ….er, something… called Mofu Tofu… not even sure what that is. Either was Gordon. Finally came the blackened salmon, which is dry and “too fishy” for salmon. Gordon took that to indicate the fish might not have been refrigerated properly. Gordon talked to Dean, and told him that the food looked like a dog’s dinner and tasted hideous. While talking to him, Gordon started to feel sick. They went to the back of the restaurant to look where the food was being kept. The was rotten food, frozen turkey melting with frozen salmon in the same container. Gordon said it was a disgrace. Dean and his sons is done to talk with them. The chef, Aurelio, came two hours late, and the owners confronted the chef about it. They sent him back to the kitchen to take care of things. Things are really emotional for him. Gordon went to observe what was happening in the kitchen, and asks about the condition of the food. Aurelio said he’s “just a cook”, and Dean stepped in to say it’s his (Dean’s) fault. Aurelio said (in the one-on-on camera interview) that he can do pretty much want he wants at this place, and that’s why he never left. At dinner service, the customers complained amongst themselves that the food is bad. Gordon went to the kitchen, and found a package of what Dean called “Unduck” – fake duck. Dean said it was popular. Next up – fake fish! “Unfish”! Gordon wasn’t impressed. Gordon confronted the staff after service. Gordon said that nobody took responsibility for service. 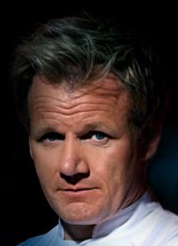 Gordon said the main problem was the food, and that he didn’t like conditions of the kitchen. He wanted that kitchen cleaned, and put an “F” over the “A” health inspection report, with the instructions that he’ll personally take that “F” down when the conditions of the restaurant is an “A”. They throughly cleaned the kitchen throughout the night. The next morning, Gordon met with Dean at the top of the canyon for a pep-talk, and told him to say what he wanted to, to the staff. Dean didn’t seem into it at first, merely talking quietly about what he would say. Gordon told him he really needs to get into it, and yells as an example. Dean still didn’t get it, but in the end was really yelling about what he wanted his staff to do to change things at the restaurant. So what happens back at the restaurant? The first person Dean confronts is his son, Sammy. Sammy thought this was great. Gordon inspected the kitchen, and everything looked great. The “F” came down. Next up, Gordon showed how to make some great looking dishes. Before dinner service, Gordon gathered everyone together and told them there was a serious infraction the night before – and brings in a police officer to handcuff Dean! Of course, that was all for show – Gordon just wanted to make sure that Dean was the one giving the orders, not picking up after everyone else in the restaurant. They were all a little freaked out about this, and were relieved it was a stunt. Food service started, and the first thing Gordon noticed was that Mark was sweating a lot. Mark said that he didn’t like wearing deodorant. Back in the kitchen, Gordon caught Dean trying to help with cooking, which quickly stopped. Dean got more into ordering other people around. They run out of the halibut special, and Mark takes an order for three anyway. Dean was pretty upset about this, and told him that he shouldn’t be taking orders. Next up, Gordon found that Mark was putting menus under his sweaty arms. Dean sent Mark home to get a new shirt; Gordon went out to get deodorant at a convenience store.. They meet back at the restaurant and Mark put on the deodorant. Gordon then got the police officer to take the handcuffs off of Dean, after Dean promised to not fall back to his old ways. Unfortunately, things still weren’t going well. A customer found hair in food, and another had cold pasta. Dean brings it back to the kitchen, and confronts to Aurelio, and argued with him. Afterwards, Gordon has good news and bad news. Good news – the specials went quickly. Bad news – the rest of the food is bad. He told them they’re relaunching the next day. Gordon’s staff went in and changed everything: new benches, new shades, new paint – a complete change. The new menu brought out the emotion in Dean, and he gave Gordon a big hug. He showed them the food, and it looked great. They tried it all, and they liked it. That night at relaunch – Mark started taking orders, and Dean didn’t like that at all. He really confronted Mark forcefully, and Mark got the message. In the kitchen, Dean confronted Aurelio and they have it out. The chef didn’t want to listen, so he left. Gordon yelled after him to stop, but he kept driving away. Gordon thought that Dean’s gone a little overboard on confronting staff. Aurelio turned his car around, and went back to tell Gordon that he was sorry. Dean saw him and they started to argue again. Aurelio said he was owed $140. Gordon gives him $100, and told him the rest comes after service. Then Gordon took Dean aside and told him that he has to take a deep breath. Customers were waiting for their food because of Aurelio’s absence; Gordon got everyone together and tells them they have to pull together to get through the night’s service. After this, things seemed to go a lot better. At the end of the night, Gordon said things went a lot better. He again took Dean aside, and told him that he has everything he needs to succeed, and that he wanted to place to succeed. In the end, it really looked like it would. It’s 2008! You know what that means, lots and lots of lists about various things that happened in 2007. You can add this one to the list of those lists. The very popular show“24” started up again. What would Jack do this time? Who would he go after? Well it turned out that Jack did what he does best, which is shoot people, and it pretty much didn’t matter who it was. What else did we find out? We found out that Jack Bauer’s tears cause nuclear weapons to go off, and that after seeing that at the very beginning of the season, the show pretty much went down hill from there. I mean, how do you top that? Let’s hope 2008 is a better year for Jack. With football season at an end, and the Superbowl right around the corner, most of the country found out that teams that didn’t come from either coast of the United States were about to be locked in battle. I speak of course, of “Survivor”. This go ‘round, they are in Fiji. In this all new “Survivor”, they sat around and complained about each other, ate really nasty things, and voted each other off the island, which was completely different every other “Survivor”. America was further astonished to find out about two teams that are just over 200 miles away from each other, in mysterious places called “Illinois” and “Indiana”, and which reside someplace called the “Midwest”. Americans are even more surprised that these places have football, and that, somehow, they are both going to the Superbowl. After getting over this whole “Midwest” thing, organizers logically held the Superbowl in Miami, Florida. Miami is basically very much like New York, except New York cab drivers are scared to drive there. Many, many people came to the Superbowl, and advertisers spent millions of dollars on ads. There was also a football game. The Indianapolis Colts won. In March, a show about a bunch of people who have done terrible things and lie about it came on television. It looked like it was going to be a hit, until everyone realized it was just the presidential candidates starting up earlier than ever before. Someone in Hollywood must have had the inside scoop on this, since they were able to create a show based around a similar set of circumstances, where people pretend to be someone else: “The Riches”. The show starred that great comedian Eddie Izzard, who creates great dramatic performances while still making things funny at times, all while not wearing a dress. In April, shows that started in the Fall of 2006 were already starting to end. The shows “30 Rock” and “Studio 60” both started in the fall were each about late night comedy shows except that one was actually good, and lived through the entire season. “The Sopranos” returned in April, and people were very anxious to see how, in just a couple of short months, Tony Soprano’s fate would be resolved in a nice uncomplicated and unambiguous way. The season finale of “Lost” came in May, and as usual, everything that happened in the show was completely crystal clear. That is, if you wash your crystal with butter. After audiences had gotten used to seeing a lot of flashbacks, this time the writers turned things around and did a flash-forward. I look forward to the next season of Lost when they start doing flash-sideways. A show called “On the Lot” debuted. It aimed to find the next Steven Spielberg, and it turns out that people were pretty much satisfied with the Steven Spielberg they already had and didn’t watch the show. People were very upset when “Jericho” was cancelled, and they decided to send CBS a message. After thousands of pounds of nuts were sent into CBS headquarters, the network said that they understood, and were going to take immediate action: They announced that Dan Rather was coming back. This announcement was short-lived when CBS realized that what people really wanted was Jericho back. CBS agreed, and later in the year said that it would be back in 2008. Dan Rather lobbied to be on “Jericho” as a newscaster, but executives thought it would be completely implausible. “The Sopranos” ended, and someone thought it would be a good idea to end the show by abruptly going to black. Most of The Sopranos audience thought it would be a good idea to go see the writers of the last episode and abruptly make them black and blue. Take a group of people, have them dress up funny, do strange tasks and pay the winner million dollars at the end. “Survivor”? No, unfortunately, it was “Pirate Master”, and it made its debut in June. To say this show stunk like Limburger cheese would be just mean and nasty to Limburger cheese. CBS, hoping to appease the steaming, frothing mouths of “Jericho” fans, started rerunning the show in hopes it will buy the network some time until new shows can be produced. Final episodes of the show “Drive” started to air. The show tried to be mysterious as “Lost”, except without the island, weird smoke monster, and the excitement. “High School Musical 2” debuted, and thousands of teenagers fainted in all the excitement. Parents everywhere were bewildered how a musical could do that to today’s youth. Bob Barker said goodbye to “Price is Right” after approximately one million years of hosting the show. He will be missed. Millions of “Lost” fans started searching their dials for where “Lost” was. That answer: January 2008. The writers for the show struck a deal in which they could run all the shows back to back, without doing any reruns. Everyone seemed to be satisfied by this, and the only thing that could through a wrench in those plans would be a writer’s strike, which seemed HIGHLY unlikely. A nation watched as Whoopi Goldberg joined “The View”. A nation asked, “I really wasn’t kidding last time, the show isn’t really still on is it?” A nation would be disappointed by the answer. “Moonlight” premiered. This was a show about a brooding vampire that helps people instead of sucking their blood. This show was much better the first time around when it was called “Angel” and had different actors and characters. Heroes season 2 debuted, but started somewhere in the middle of the story which confused the living heck out of people. Most of the new characters are interesting and include live versions of the Wonder Twins from the old Justice League cartoon. Instead of having the ability to morph into different objects, when their Wonder Twin powers give the brother the ability to make his sister stop crying, which is a good thing since her tears are black and kill people. Another new character seemed to have a mysterious stalking ability which he used on the cheerleader, Claire, but it was later revealed that was wrong. He could fly AND stalk her. “Chuck” debuted. This show was about a clerk at a big box store that had all of the national intelligence secrets downloaded into his brain, leaving him a complete moron. Well, that’s want would happen if that were really true. What happened on the show was he, naturally, becomes a spy and helps the real spies thwart bad people from doing bad things, all while retaining his original job. “The Office” debuted, and we finally found out that Jim and Pam were dating. Not in the open, (at least at first), but dating none the less. Everyone was waiting for a new program people will be talking about all week after each show. That program was: “Cavemen”. The things people were saying were, “Urgh, Wurf, and Blech”. Those aren’t cavemen words either. Fortunately, by now most of those people have finished having their stomachs pumped, and are now able to watch regular programs again. They have, however, been asked to step away from any shows with the words “cave” or “men” in them. “Big Bang Theory” was another new show, this one about a group of nerdy types that hang out with a girl that lives across the hall. The entire basis of this program was to show that making jokes about topics in nuclear physics, Greek philosophers, and chemistry was a completely untapped resource… and for a good reason. It was hard to tell which was more implausible, that people with high IQs could be so social unaware, or that the socially aware could have such low IQs. “The Next Great American Band” was a show in search of the next great American band. There are many talented people on the show, just chomping at the bit for an opportunity to be taken to the cleaners by the record industry. Drew Carey started on “Price is Right”, taking over from Bob Barker. Drew was on a lot of game shows this year, including the “The Power of 10”, “Whose Line is it Anyway”, and the newly announced, “The Power Price is 10 Right Lines Anyway”. The Writer’s Strike started. The writers were trying to get a little more money for each DVD sold, and, horror of horrors, they want to get paid for programs that others were making millions from. With everyone in Hollywood making money on shows, it is hard to believe that the writers are usually the low people on the totem pole. Even the sewer cleaners in Hollywood advised the writers, “You really need to get a better contract”. Having no new shows struck fear into the hearts of the Hollywood moguls, and they’ve already taken steps to deal with the strike. Most had already switched from lighting cigars with $100 bills to $20 bills. What this meant was shows that should have been off the air sooner than they were (like “Cavemen”) stayed on longer than they should have. Many TV shows came out on DVD in time for the Christmas season, and even TV shows that were made into movies and then put on to DVD, to later be put back onto TV after DVD sales die out. This includes “The Simpsons” Movie, which asks the question: What does a spiderpig do? David Letterman made an end run around CBS which doesn’t actually own “Late Night with David Letterman”, and struck a deal with his writers to come back to work. The other late night shows are going to try and do this without writers, and we’ll just have to see how that’s going to turn out when they debut in 2008. With Thanksgiving and Christmas over, and a lot of football still to play, most of the programs that have already gone into re-runs because of the writer’s strike have gone unnoticed, and probably will do so until the beginning of 2008 when people start to realize what a real horror this could all be. There is going to be a lot more reality programming headed our way, so be careful not to step in it. The memorable events in this season were this was the first time someone pulled out something they thought was an immunity idol but wasn’t, the first time someone ended up with TWO immunity idols and still got voted off. Having said that, it definitely wasn’t the most memorable Survivor. Before tribal council, I thought that Amanda went in with a good chance to win because Courtney and Todd ticked so many people off. During tribal council, it came out that it was Amanda’s idea to get rid of James, which I think was a surprise to him. I think James would have liked to have found that out before he had a chance to ask question (he was first, so he didn’t get to ask anything afterwards). Jaime, Denise and Peih-Gee were especially upset at the final three. I think it would have been better for them to ask the questions in the order they were voted off. Anyway, afterwards it looked to me that Todd would probably win. From the way people reacted, Denise addressed Courtney, it sure seemed like Denise would vote for her. I didn’t think Jean-Robert would vote for Todd, and I don’t think James would vote for Amanda. Todd wins. It almost ended in a tie… what if it had ended in a tie? Anyone know what they would have done in that case? During the reunion interview Jeff asked Jean-Robert about the vote he made for Todd (! ), and Jean-Robert said that his mind was changed because it was the best move to vote him out. The Jeff asked Todd, and Todd admitted that he did play on Jean-Robert’s ego. Jeff asked James about “the biggest blunder in the history of this game” asking why he didn’t use the idol, and James said that he made the mistake of trusting his alliance. Courtney started the game at 93 pounds and ended at 86 pounds. James said that he’s had a lot of people that came up to him telling him that they liked him on the show. The craziest thing that’s happened afterwards and that after a funeral a couple of ladies were excited that they were able to meet him. Denise’s return was a lot different. They didn’t rehire her after the show was over, saying that she would be too much of a distraction for the kids. She now has a job as a janitor at the school, but she has to work the night shift. She asked that if anyone had a lunch lady job, she’d like to hear from. I have to say I think it’s pretty crappy that the people at Denise’s school treated her this way. I think that’s pretty petty. Jaime and Erik are dating. Chicken said, “If I didn’t win the money, I wanted to go first”. The Sprint $100,000 prize went to the most popular survivor: James. The other two most popular people were Peih-Gee and Denise. And talk about a live show: Mark Burnett, creator of Survivor, after listening what happened to Denise, told Jeff during a commercial break to tell Denise that he’s going to give her $50,000! The next survivor starts in February: Survivor Micronesia: Fans vs. Favorites They’re taking fans of the show and pitting them against survivors of seasons past. One of those survivors will be someone from this season. Survivor items will be up for auction at http://www.pedaids.org/. What did you think? Did the right person win? Great premiere episode of Kitchen Nighmares, the American version of Gordon Ramsey’s British Show “Ramsey’s Kitchen Nightmares”. Gordon went into Peter’s Italian Restaurant to find the kitchen on its last legs, rotten food, and a broken fridge. Most of the people in the restaurant considered Peter (one of the co-owners) part of the problem. As is usually (but not always) the case, Gordon was able to turn the place around. I was quite surprised to see that Peter changed so much. I have to give Peter a lot of credit, I think he’s really helping in the restaurant’s success. Hopefully they’re still doing well. You can really tell that Gordon cared about what happens at the restaurants he’s trying to help, and despite what others have said on other blogs, he definitely shows a much softer side than his appearances on Hell’s Kitchen. Running a kitchen, and helping to bail out someone else’s kitchen are to very different things, and these shows show that difference. You might be wondering what the main differences are between the American version and the British version of the shows are. The biggest difference was that in the British version, Gordon does the voice overs for the show himself. They have someone else doing the voice overs for the American version of the show. Personally, I like it better when Gordon does them because it feels like he’s leading you through the process. The second big difference is that I don’t recall ever seeing Gordon revamping a kitchen like he did on the show tonight. New ovens, a stand-up fridge, new plates, etc. There might have been one BBC show where he did this, but not to this extent. All in all, I wonder if this show is going to last, only because it seems like more of a show you’d see on Food Network or Bravo. I hope it does stick around though, because I really enjoyed it. This show is in the “I’m not sure why I watch this show, but I do” category. Variety is reporting that effective immediately, Pirate Master has been cancelled. You’ll be able to see the last five episodes online at cbs.com. Thanks to John for sending this in.